December 2007. Retreat outside Tucson. Beautiful soft rain falling off and on all day with the top of the Catalina Mountains in the mist. I walked around the grounds today. What a beautiful oasis they have created here with a stream and waterfalls and walking paths through a desert-scape. I got to talk to Sarah Weddington today. I was thrilled. I spent an entire hour sitting one seat behind her two days ago on the shuttle from the airport but didn’t know who she was at the time because I don’t put myself out there and say, Hello, who are you, tell me about yourself. I wouldn’t have, anyway, because I heard her say she was tired and was going to rest until we arrived. And I had my headache. From the back she looked a little rumpled, and her long gray hair was falling out of a comb where it was loosely attached. She was kind when we checked in and offered to let me go ahead because she said she thought I was more tired than she was. I am so glad I refused. Especially when they introduced a keynote speaker the next day and she came striding out dressed beautifully in power purple-blue with her white hair neatly coiffed and talked to us about her life and her experience with breast cancer. In addition to her own huge accomplishments, she was also a personal friend of Ann Richards and Molly Ivins. I wish I could even imagine what friendships — and conversations! – between those powerful women were like. Richards died in 2006 from esophageal cancer. Ivins died in January 2007 at the age of 62 from breast cancer. I’ve come to think of cancer cells as being like Osama bin Laden. We don’t know if he’s dead or alive and hiding in some cave. Similarly, I don’t know if the cancer is dead or alive and hiding in body caves and waiting to jump out and shout “boo!” I’m grateful to be NED, but I’d prefer to have a more permanent diagnosis. …… My journey continues day by day. I am simultaneously acknowledging uncertainty and planning for the future. I am still searching for Osama but also finding more reasons to celebrate life. I would have gone to Tucson just to get to meet Sarah Weddington. Her work and dedication and drive is astonishing. And I am humbled to meet someone who knew Ann and Molly. We all suffered with the loss of those two women. May there be no more Osama for Sarah. Today I was making a cup of tea during a break when I saw Sarah in the hallway and I got to introduce myself and tell her how much I admire her. And I told her how much we miss Ann and Molly. December 2007. It is not a perfect world. I had stared at the photo of the labyrinth for months on my notebook desktop. 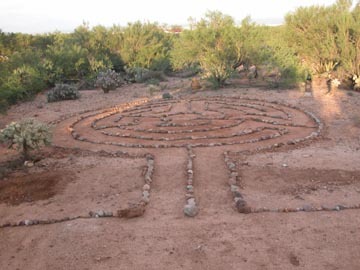 When I finally arrived at the retreat for cancer survivors and oncology nurses and found my way along the paths to the labyrinth, there was a construction fence around it. Loud men and their machines dominated the atmosphere, just like in real life, and I had to decide whether to let them come between me and the meditative experience I had planned. Just like in real life. The fence blocked the view of the Catalina mountains from the backdrop but I could see them overhead – craggy, mystical, foreboding, not green and lush and soothing like the pine forested Rockies. 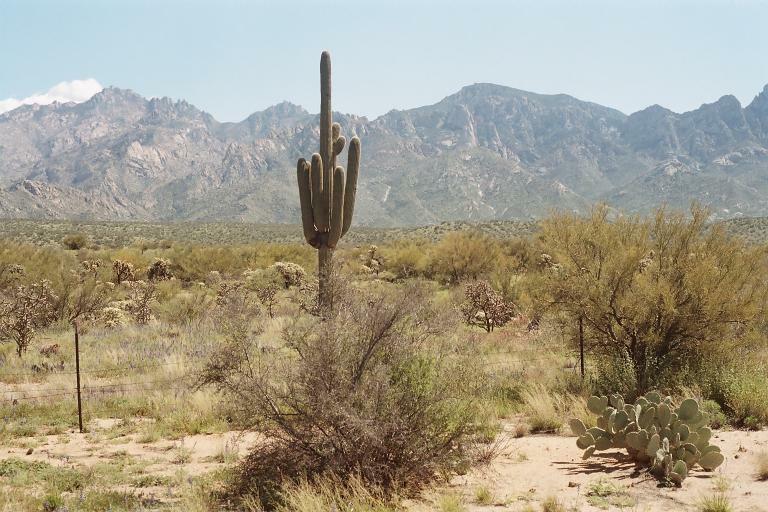 I thought how inhospitable the mountains would be to people walking over from Mexico. I was disappointed – should I go ahead and try to walk the labyrinth the way I found it? It had taken every bit of energy I had and then some to make the trip. I was not coming all this way and not walking the labyrinth. So I started the walk in spite of the loud men and their machines and the imperfect world. I picked up a small rock to carry with me to begin a meditation with, as I did with all my walks. It represented my self-centeredness and my self-preoccupation, especially since my cancer diagnosis. It was broken on one side. It was rough to the touch. It had been broken traumatically, not worn smooth over time. It hadn’t been aged in water, but was ground by sand in an arid place. I noticed snake holes in the ground. This would be a place to be wary of rattlesnakes – cascavel – in warmer weather. Maybe even now. The holes looked new in the sand in some places. I walked around them. I continued on in spite of them and knew I would have done so even if it had been warmer. There was no one else around. The wind blew my hair. I wore my shawl around my waist in case I needed it around my shoulders before I was done. The clouds were gathering at the top of the mountains. A golden thread of sun lit the edge of the clouds. I was full of my dissatisfied self as I walked, my regrets and resentments and recriminations. I was angry and afraid because I had cancer. I had surgery and six weeks of radiation completed six weeks before the retreat. I was afraid I made the wrong decision about chemo. I thought I would be glad to be back to my “normal” life at work but I still didn’t feel good. Everything took an enormous amount of effort, including making this trip, and I acted like a baby when I got there, needing special attention even though I was in a large group of women who also had cancer and many were in worse health and had been through much more than I had. What was wrong with me — could I go nowhere and just be a part of a group? Wasn’t there anywhere I fit in? Why was I here? Why couldn’t I just relax and enjoy this? Me. . . . me. . . .me. Whine. . .. whine. . .whine. I was distracted by these thoughts more than the noise from the construction on the other side of the fence. The path became narrower and the turns sharper as I neared the middle of the labyrinth. I reached the center. I took the rock that was my ego and selfishness and placed it on a pile of rocks of various sizes. I didn’t put it on the top – just to the side. As soon as I let go, I realized that each little pebble and stone represented a person who had entered here looking for something and found a memorial to the hope we held in our spirits. I saw them lay down their pain and lift up their prayers: a sisterhood. A community. Not individuals. There was healing here in this unity. I turned around to walk the paths back out, to complete my counter-clockwise journey, an unwinding of what had been too tightly wound and as soon as I faced the other direction I was no longer thinking of my broken self, my baby-ness. I picked up a rock for my sister, because she loved my picture of the labyrinth. I saw another little smooth stone that had lain under the feet of those who walked and meditated here and I picked that up for my friend _______, another breast cancer sister. And I picked up another one for ____ who has some trials but hasn’t told us what they are. I picked up another one for _______, the first of the Towandans to tell us she had cancer and has been through this for five years now. I thought of the talk at the retreat today: Get Strong. Stay Strong. Help Heal. I continue to hear that same message as in AA: turn your thoughts to others. Heal yourself by healing others. It may not change the “prognosis,” the numbers, the survival rate, the chance of recurrence, and no one would study that because there is no profit to it in the business world. But it probably changes our entire perspective on life, the way it does when it is practiced in AA. When we begin to heal, we want to turn our thoughts to others and share our experiences in ways that help people through things we may not have had help with. To give a hand where we really wished we would have had one. And that helps us.